Substantial infrastructure investments are currently reshaping Helsinki and Tampere, Finland’s two largest urban centres. The aim of most ongoing projects is to create new hybrid urban landscapes which will replace or modify large-scale transport infrastructures. These changes are taking place, in particular, around rail terminals and mid-20th century urban highways. The Finnish projects echo transformations in many European and North American cities, where single-use traffic zones are being converted to mixed-use neighbourhoods and parks to boost cities’ livability. The notion of urban livability has recently made swift inroads into planning and policy discourse on the back of the 21st century ‘back to the city’ movement. We may talk about a paradigm shift in planning. The new urban agenda is founded on structural issues such as competition between cities over investment and residents, Internet-driven changes in work and services that are re-asserting an emphasis on high-quality urban locations, innovation as a driver of the post-industrial economy, and the related continued value of face-to-face human contacts. Furthermore, climate-change awareness, the need to reduce energy and material consumption, and changing demographics characterized by shrinking but more affluent younger generations and growing numbers of elderly citizens – both with distinctly urban living aspirations – are adding weight to the ongoing shift. 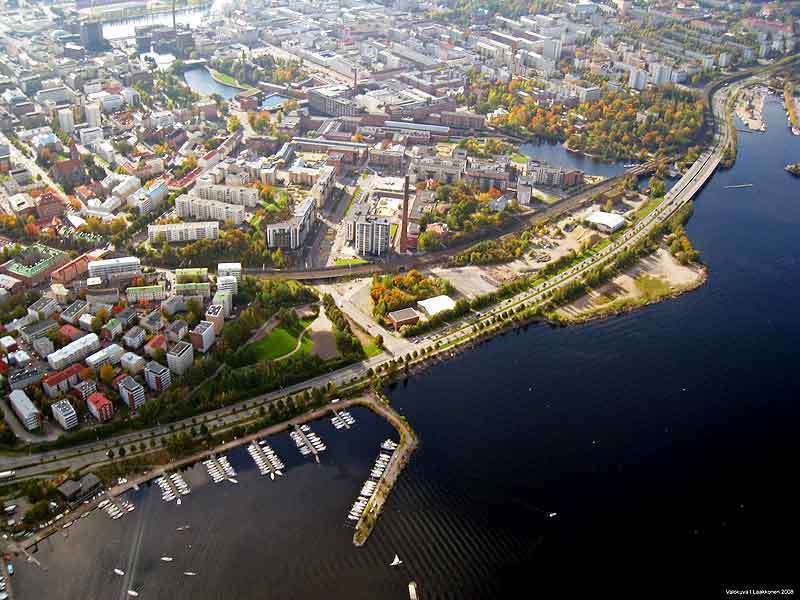 In Helsinki and Tampere the urban shift has given rise to two different methods of dealing with primary infrastructure retrofits and to two patterns of urban development to create new urban space. In terms of method, cities are either choosing to keep, but downscale, original functions on the surface of the land or to bury the original transport infrastructure under decks and tunnels. In terms of type of development, the options are to create either traditional urban areas, complete with urban streets and blocks, or super-dense nodes which concentrate all functions together in one place, typically in indoor facilities resembling shopping malls. Generally, the discourse around transport infrastructure projects in Finland and elsewhere interestingly reproduces the people-centric planning concepts that were in the past employed by architect Jan Gehl and his firm to transform central business districts by turning congested streets and surface parking lots into pedestrian streets. This time round, it seems that the ideas have effectively made a leap to the regional level of urban planning and that the goal of achieving lively small-scale pedestrianism has grown into a desire to achieve connected neighbourhoods which are pedestrian and yet transit-friendly, environmentally conscious, and which offer mixed housing types as well as attractive parks. Kamppi Center. Photo by Mahlum/Wikimedia Commons. Helsinki’s first major infrastructure retrofit strategy, a strategy which is already being realized, involves intensifying development around transit hubs, particularly at rail nodes. 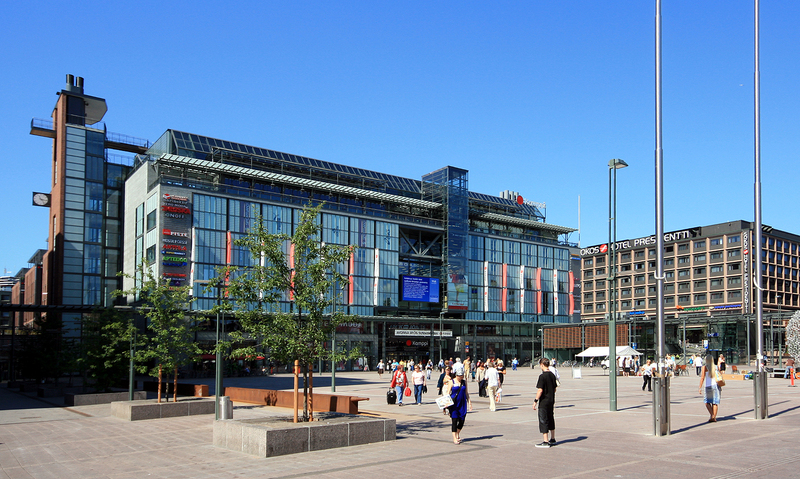 Kamppi Centre (2006) in the heart of Helsinki may be considered a 21st-century prototype for this type of infrastructure redevelopment. Kamppi Centre is a 135,000 sq. m complex consisting of a large shopping mall, housing, and offices on top of a regional and long distance bus station and a metro station. Prior to this project, the bus station was a surface function; it has now been buried underground in order to free up approximately four hectares of land for redevelopment purposes and, ultimately, to increase efficiency of land use in central Helsinki. 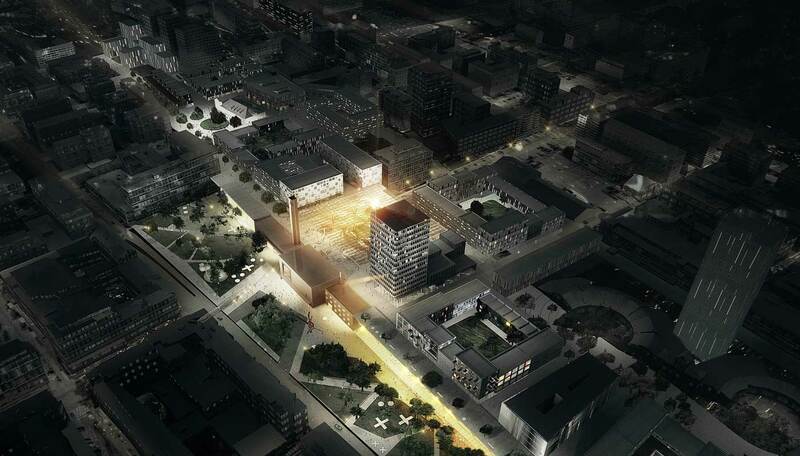 The same approach has now been taken in the planning of Kalasatama on the eastern edge of the inner city. Here, a mall complex twice the size of Kamppi, together with eight mostly residential high-rises and a public health centre, are set to evolve as the centre of a large new brownfield neighbourhood on top of and around a metro station and the city’s eastern entry highway. Completion of the centre is planned for the 2020s. Helin & Co./Ville Riikonen. Kalasatama. Project for multifunctional city block. Last year, Helsinki also revealed its plans for redeveloping the city’s second major railway hub in Pasila. The station connects regional, domestic, and international train services and is located at the side of a large railway yard – a wide ravine separating the neighbourhoods of Eastern and Western Pasila. By the 2020s, in addition to the creation of new underground railway capacity, a considerable part of the existing railway yard in Pasila will have been replaced with a three-block complex called ‘Tripla’, which essentially will expand the station’s current deck area to connect the two sides of Pasila. The project will have 140,000 sq. m of development in the form of a shopping mall, housing units, a hotel, a multipurpose arena, and high-rise office towers. This phase of Pasila’s redevelopment will bring 3,000 new residents and 15,000 jobs; there are plans to keep on adding new development to the north and south of Tripla. OMA and Arkkitehdit Soini & Horto Oy. Tripla, a multipurpose deck complex, connects East and West Pasila. Image courtesy of YIT. When evaluating Helsinki’s plans to construct major shopping mall environments, a question well worth asking – given recent urbanization trends – is whether the new mall areas are really the kind of urbanism that people want. Centralized and enclosed development patterns are likely to significantly reduce efforts for creating inviting public spaces and streets outside the malls – and thus to result in fewer opportunities for achieving vibrant urban life. Development patterns based on traditional urban streets, on the other hand, are associated with public life since they act as spaces for movement as well as for the city’s political, symbolic, and ceremonial functions. From this point of view, mall areas can be seen as culturally unproductive. As if in answer to that question, Helsinki has also taken an active interest in the idea of ‘boulevardization’. The latter involves downscaling and retrofitting the city’s urban highway environments into Parisian-style boulevards. The ‘boulevardization’ concept has run in and out of planning debates throughout recent decades, but it seems that after its recent re-emergence following Carlos Lamuela’s 2010 master’s diploma for retrofitting the easternmost section of Länsiväylä, a six-lane entry road in the west of Helsinki, the term is here to stay. The basic idea is to thin down broad highways to about half of their present width. This will give the same capacity in terms of numbers of vehicles, but the vehicles will move at lower speeds, which will mean less traffic noise and emissions. The transformation also frees up land beside the roads for development and boosts the value of adjacent real estate. At the moment, Helsinki’s strategic planners are envisaging doing the same to all of the city’s major urban highways inside Ring Road I; this could amount to as much as 6 to 8 million square metres of space in the form of new residential and business development. Unlike the mall pattern, the boulevardization method is inseparably linked to an aspiration for introducing more open, city-like, urban fabric into the city. The city’s planning documents are accompanied by visualizations that underline new urban spaces revolving around classic boulevards for all modes of transport, mixed uses, and high-quality public spaces. The general argument is that by filling in fractures in the urban fabric caused by large-scale highway environments the city is removing barriers between neighbourhoods and centralizing residential and business development to serve the needs of younger generations. However, many obstacles still need to be surmounted before we see these new boulevards in Helsinki. Not least importantly, the city needs to find proper tools for materializing the kind of dense and continuous urban space imagined by the boulevard visions. The problem is that recent decades have proved that Finland lacks expertise for developing dense urban neighbourhoods that are able to offer the same urban experience as the pre-war inner-city neighbourhoods do across the country. On the contrary, the planning system’s prevailing approach has conventionally aimed at organic decentralization. Much like in Helsinki’s Pasila, Tampere’s first politically approved (2011) infrastructure retrofit project is based on the concept of covering up railway tracks around the city’s train station. This strategic move began with an initiative to construct a large new multipurpose arena and high-rise office and residential towers with street-level shop space on top of a large deck structure just south of the station, adding up to roughly 130,000 sq. m of on-deck development. As in Pasila, the project seeks to fill an empty space left by the railway tracks in the city centre. However, a key difference from Helsinki’s deck and station retrofit is Tampere’s aim of favouring open urban streets as opposed to centralizing functions in a shopping mall. Due to insufficient funding, the construction work is yet to commence. This notwithstanding, the city launched an ideas competition earlier this year in an attempt to proceed further with its goal of connecting the now-disconnected sides of the inner centre by expanding the retrofit project to the rest of the train station area and its immediate surroundings (roughly 18 hectares). Again, the purpose is to find solutions that will promote continuous urban development in the city centre, as opposed to concentrating facilities inside buildings. ReConnecting Tampere won the city’s design contest for the new Tampere Travel and Service Centre.See full competition entry here. Image by COBE Aps and Lunden Architecture Oy. In late 2013 the city got its first retrofit project underway when it started tunnelling operations for the most central section (2.3 km) of its only high-speed city-centre highway. Tampere is located on a narrow isthmus between two large lakes; the four-lane road runs along the shoreline of Lake Näsijärvi on the northern side of the city. Since the 1970s, the road has on the one hand provided access to central Tampere from the suburbs and an efficient way of bypassing the city, but on the other has also very efficiently blocked citizens’ access to the lake. 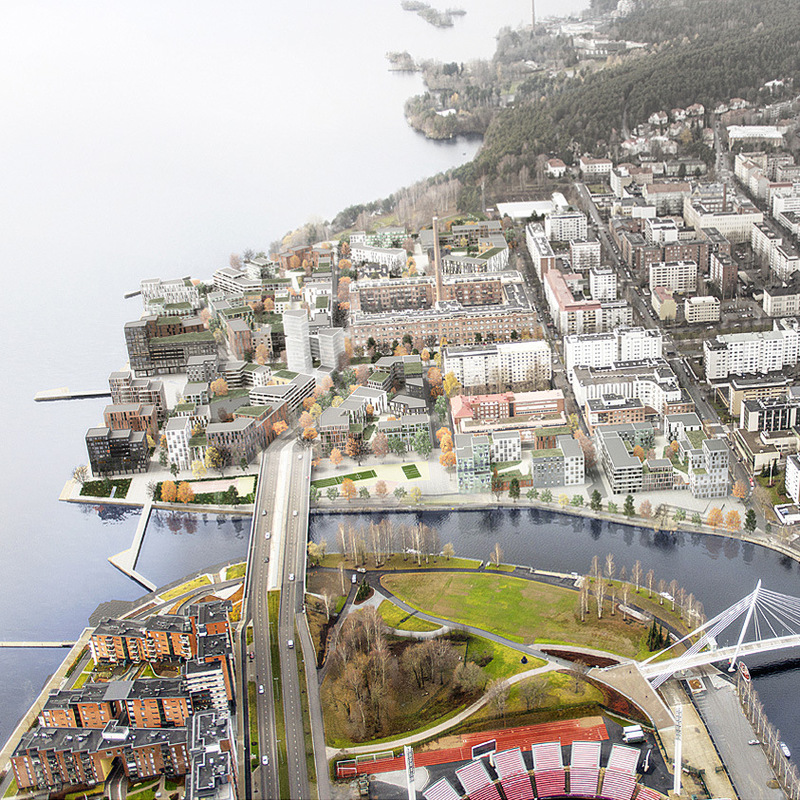 The retrofit project involving the tunnel is intended to preserve the road’s functions while restoring access to the lakeside areas and creating new centrally-located urban neighbourhoods for about 6,000 residents on the land thus freed up. Tampere’s soon-to-be-tunnelled urban higway. Image source: The City of Tampere. Due to the nature and status of the road as a national highway, boulevardization plans such as those as in Helsinki have never been discussed in Tampere. Fierce political debate preceded the choice of the deck and tunnel method, whose advantage is that it requires minimal reorganization of existing traffic systems. The debate was essentially about the cost of the tunnel. Arguably, it is a fair question to ask if segregation of people and traffic through creation of heavy and expensive new infrastructure, as in Tampere’s tunnel and deck option, is ultimately a viable option. Whereas new deck structures at rail transit nodes are generally justifiable, especially if a city is simultaneously investing in new transit options, it is questionable if the same can be argued for highway decks. In the latter case, cities are essentially spending a lot of time and money turning enormous areas of land into car-only zones for the second time round. Unlike the boulevard model, such investments are very expensive in the first place and offer very little financial return to the public sector, which has to pay for their maintenance and upkeep. On the other side of the city centre, at Eteläpuisto (South Park), an interesting architecture competition has recently taken place. It was won by Johannes Tovatt (Sweden), who proposed reducing vehicle flow and slightly changing the route taken by the local highway, turning it into the main street of a traditional urban street block, on the way to Lake Pyhäjärvi. The second winner, KCAP Architects, was not so bold in its urbanizing ideas. Open discussion of the question of how to develop the lake shore is currently underway, involving the general public and experts. Tampere’s Eteäpuisto in the future. Image by Tovatt Architects & Planners. A new tramline linking the centre of Tampere with its eastern and western fringes will be given planning permission before the beginning of summer. The tram system is an integral part of a comprehensive strategy aimed at reducing the load on the railway hub, and will facilitate other improvements and densification of the city centre. Time will show how these transport infrastructure retrofit projects will proceed and what impact they will ultimately have on the livability and attractiveness of Helsinki and Tampere. However, given the variety of transformation methods and patterns being tried out, other Finnish cities will have the opportunity to evaluate carefully what works and what does not. I think the Helsinki City is rising up to the challenge of figuring out the right tools for building dense urban structure around boulevards. Just a few days ago, they published a background document that researches various ways for building dense blocks and combining that with noise reduction. I’m sure the models will prove useful during the detailed planning phase. That’s true! But really I hope they not only talk the talk, but also walk the walk. I share your concern regarding the development of malls. Just before I got to that paragraph I was thinking how each of the big projects in Helsinki included tons of square meterage dedicated to malls. Do we really need that many? Is there some way that we can at least try to cater to smaller, more independent business moving into such malls rather than row after row of multinational chains? I recently studied large-scale urban development projects around the Baltic Sea Region, and it was interesting to learn that in some cities like Copenhagen and Hamburg they have banned mall development when planning for new neighborhoods to keep them lively. Also, for example the Ørestad project in Copenhagen includes a large mall and has faced a lack of interest as a neighborhood. I hope the winds will soon change here, too! I also agree that if malls need to be built, why not try one that’s completely different? 95% of Finnish malls have the exact same stores. When you’ve seen one, you’ve seen them all. A nominal boulevard option actually was included in the decision-making process for Kekkosentie in Tampere (the highway now being tunneled), but it was a boulevard in name only. The plan and renderings showed very little development along the “boulevard” and none of it was genuinely urban blocks, so it looked like there was almost nothing to be gained by boulevardization. The option looked very much like it was designed to be rejected, and indeed it was, practically without comment. A side note on the deck projects: the architectural proposals for both Tripla in Pasila and the arena and towers in Tampere were designed by internationally recognized big-name offices (OMA and Studio Daniel Libeskind), which has historically been rare in Finland. What’s more typically Finnish is that these architects are not retained for the actual realization of the plans. OMA has already been superseded now that Tripla is under construction, and I’m quite sure that Libeskind will never get to design anything that actually gets built in Tampere.